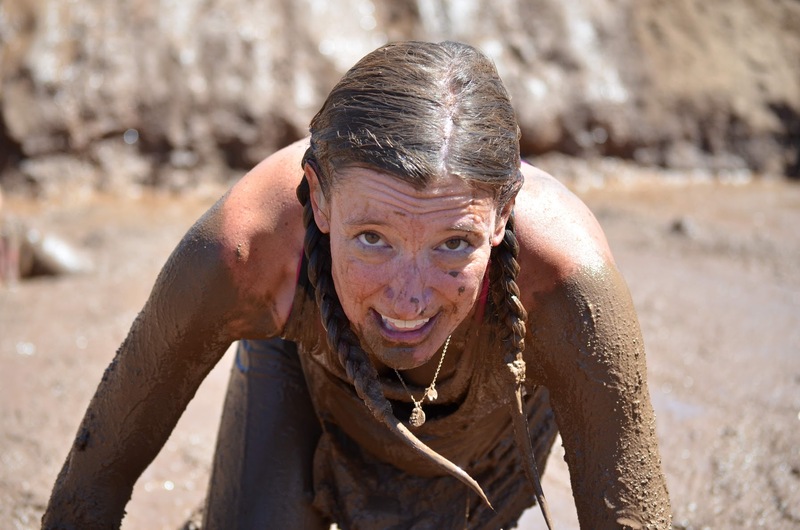 Physical challenges, like a thick mud pit, inspire mental toughness which carries through to the next challenge. The burning was searing through the rubber-dipped woven gloves I was wearing. It intensified every time I readjusted my grip and went in for another shovel-full of dirt, slowly chipping away at a hill of sand and tree roots and rock that a bulldozer helped us make a few months earlier. Just a few more scoops. Keep the rhythm. Dig, lift, dump. This burning on my thumb, as I shoveled in 100-degree heat, was nothing. It was. I had been in more treacherous conditions. And I started to remember them, as a diversion and as a mental exclamation point. I’ve carried the bucket of rocks, up the hill and down it, as my arms felt like they’d rip right off. I’ve run the eight miles in northern California, most of which felt irrationally uphill. I’ve jumped over the fire, slogged through a mud pit so thick it required every cell in my body to man-up, and crawled through spaces so tight and dark they belonged in the nightmares of a claustrophobe. And every time, despite those gross, wet, sticky, difficult challenges, I crossed the finish line. The Spartan Race, and other mud runs, had prepared me for this hill, this shovel and this burning, which I would learn later was an S.O.S. from my thumb as a pretty grotesque blister began to crack open. Or, wait. Had life prepared me for those races? I am a perpetual pleaser. Always have been. I’m the person who, for a number of years, has promised to “be more assertive” during annual performance reviews at work. And then, a couple years ago, life put me through the ringer. And being assertive became a requirement instead of an option. A tortured divorce, one that included physical violence, mental manipulation, threats and property damage, helped me find my voice and led me to my sneakers. Those sneakers led me to the road, where I ran and ran and ran, through cramps, driving rain storms and insane heat. Those runs carried me to competitions, and those competitions, along with a moderately-crass invite from a friend, brought me to Spartan. It wasn’t until I grew silent in the starting chute, managing a mental freak out about the obstacles that were ahead, that one of the people on my team reminded me that the challenge in front of me – the four miles and 25 or so obstacles – was nothing compared to what I had been living through. I had balanced bruises, broken glass, work, motherhood, therapy, exercise, bills, harassment, and, somehow sleep, to come out the other side of something that was uglier than I could have ever imagined. I hadn’t done it alone, but I wouldn’t do the Spartan Race, or any other obstacle course race, alone either. In fact, on my very first race, I jumped in to help a stranger so we could both complete an obstacle. These races beg me to keep going. In life, when the physical or emotional pain is seemingly too much to bear, and on the course, even when that first handhold on the monkey bars seems out of reach. They teach me to breathe, to adjust my pace and monitor a measured inhale-exhale pattern, to dissipate a side-cramp or let go and pick only worthy battles off the course. And, they show me that I am enough. Even when I think I’m not. I’m strong enough. I’m courageous enough. I’m fast enough. I’m tough enough. Persevering through life helps me persevere through the race, which helps me persevere through life. It’s a beautiful, sweaty cycle. And it’s taught me to keep Band-Aids in my purse, for those days when I ignore the burn and keep shoveling. Lisa is a writer, runner and adventurer raising three kids in Arizona. She writes about her experiences on several platforms, including Raising Outdoor Kids, Pursuing Kairos and The First Time Project. And by day, she works at a pretty cool ad agency called Fingerpaint.